There’s always one isn’t there? There’s always someone who has to ruin the party. In the case of digital marketing, there’s a heap of them – people who seek to exploit every loophole and trick to get you to click-through, increasing their metrics. Google’s been combating such schemes for years, and Facebook had to introduce the News Feed algorithm to reduce the reach of spam and junk content. But still, there are always more cropping up. And you can’t blame them, really. Clicks = $ in many cases, so it makes sense that some will try anything to get your attention. Here are four particularly interesting digital marketing tricks, worthy of note for their approach – though equally, worthy of avoidance in your marketing plan. Video content generates better response than any other on Facebook, and is growing on all social platforms, so it makes sense for all businesses to be considering how they can tap into video themselves. But some have found a trick on Facebook, which gives them the reach advantage of video, without actually being video content. This is a clip from the Facebook Page Lilyon Memes, which has over 500,000 Likes. As you can see, what Lilyon does is they post a static image, with very basic video elements overlaid, then post it as a video - giving them the reach benefits of both the meme itself and a video post. Well, kind of. Facebook has already announced that they’re looking tocrack down on misuses of video, under which this type of content would likely fall, though their focus has been on static image Facebook Live content, not general video posts. Still, you’d think at some point this will come under Facebook’s microscope – and if it does, and you’re driving a significant amount of traffic from Facebook, that could be a big problem for your business. Speaking of Facebook’s crackdown, as noted, their main focus has been on this culprit – Pages posting live videos with static images, normally with Reactions polls, or videos they purport to be live, but which are actually pre-recorded content. 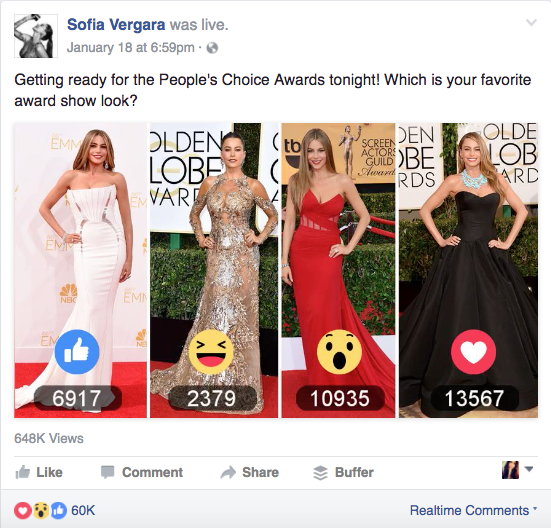 Part of the problem with the static image posts has been that they’ve proven popular – as we’ve reported previously, five of the top ten Facebook Live streams in 2016 were these type of static image posts. But still, they’re not really what live-streaming was intended for, so Facebook rolled out a News Feed algorithm tweak in August which automatically detect and restrict the reach of static images posted as video content. So, probably not a good idea. Posting pre-recorded videos and presenting them as live is a bit more clear-cut, and Facebook has started to take action, removing these false live posts as they come up (and are reported). As Facebook continues to expand their push into video, you can expect them to take more action against such violations.